Today’s recipe is for a Super Bowl Snacks & Appetizers recipe swap. I was assigned the blog The Barbee Housewife and started my search for the perfect Super Bowl snack immediately. She has so many dishes that I really, really wanted to make – loaded baked potato dip, chicken bacon ranch taquitos, pizza puffs… but none of those were going to doable for me since they contained dairy. 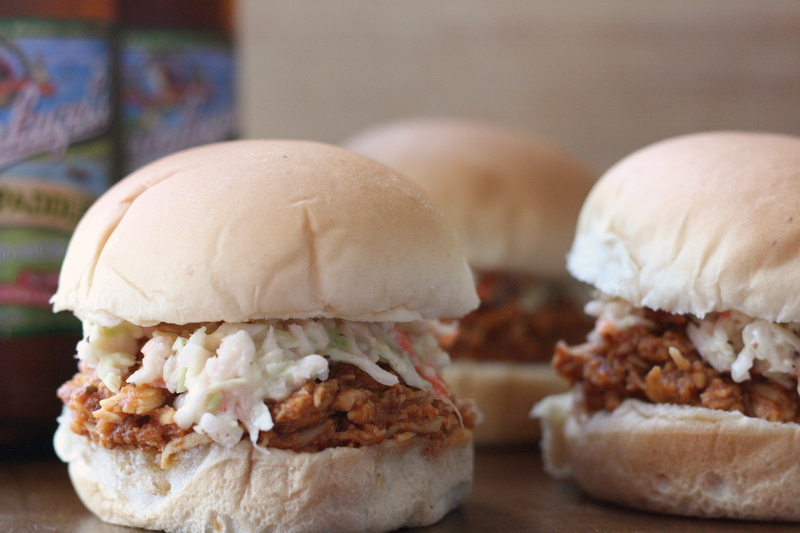 I finally decided I would make her beer can crockpot chicken sandwiches into little sliders and serve them as an appetizer for the game. These sandwiches are so good and so, so easy. One pot, that’s it. You get a ton of food and the leftovers freeze beautifully. Make these now. If you’re feeling like you want to do a little more cooking, try your hand at making some homemade barbecue sauce! Pour beer into the slow cooker. Whisk i onion powder, paprika, garlic, salt and pepper. Add in chicken breasts and pour barbecue sauce on top. Cook on low for 6 – 8 hours, or until chicken is cooked through. Remove chicken from the slow cooker, shred, and return meat to the slow cooker and stir to evenly distribute the sauce. Serve on buns topped with coleslaw. Categories: Chicken, Dairy Free, Freezer Meals, Gluten Free, Main Entrees, Meat, Slow Cooker/Crock Pot, Special Diets | Permalink. Great choice and picture! I love making these, like you said, it makes so much food and it’s easy. Perfect for a party! These sounds awesome. I love my crockpot and will have to try these out.